ARF and Armenia: How to Withstand the Challenges of the Future? Below are the comments delivered by David Grigorian (Senior Fellow, Policy Forum Armenia) at the public forum titled “The ARF at 120: A Critical Appreciation,” held at the New York Hilton Hotel on Nov. 21, 2010. Click here for the comments delivered by the other panelists and the response of ARF Central Committee chair Antranig Kasbarian. On behalf of my colleagues at Policy Forum Armenia (PFA)—a virtual think-tank uniting over 60 Armenian professionals from around the world—I thank the organizers, particularly, Dr. Antranig Kasbarian, for an opportunity to address this anniversary gathering. The fact that a developmental economist, like me—who by the nature of his profession focuses more on the future than on the past—is invited to speak here, is a welcome development and says a lot about where the ARF’s thinking is aimed at. Before I begin, however, I am required to make a disclaimer. The views expressed here are my own and should not be attributed to the institutions I am affiliated with. I should mention that neither my English nor my presentation is as polished as those of my fellow panelists, who spoke here before me, for which I apologize. So please bear with me. I am also perhaps the most impatient one among the panelists in my desire to see change take place, and for that I do not apologize! There is something I would like to say from the onset, something that has to do with why I am here today. And that thing is the understanding that the ARF is the most active and well-organized element of the Armenian Diaspora. It is second to none in terms of the patriotic upbringing of youth and the role it played in the Artsakh War. Much of what I am going to say today is on the record already, as part of PFA’s report on Armenia-Diaspora relations of the past 20 years. There we argue for a more active diaspora involvement in Armenia’s affairs, and so the rest of my presentation will essentially be based on that premise. First, I would like to review some facts of the ARF’s involvement in Armenia in recent years—election results since 2007—and offer some reasons for the worse-than-expected outcomes. Second, I would like to share with you my take on Armenia’s developmental challenges and, time permitting, put that in the perspective of both our own resources as well as the trends taking place in the rest of the world. Finally, I would like to offer some recommendations on what the ARF can do to better meet the challenges before itself and the Armenian nation as a whole. I wanted to start off with a brief trip to a not-so-distant past and ask you to visualize a bar chart that has the following percentages of votes received by the ARF in the 2007 parliamentary elections, the 2008 presidential elections, and the 2009 Yerevan municipality elections. While PFA’s research shows evidence of fraud and irregularities against certain political parties and candidates, we conclude—at least in the cases of 2008 and 2009—that there was little, if any, systemic fraud conducted against ARF (or its candidates) in these elections. So these numbers are really the fraud-free popularity ratings of the ARF in Armenia. Now, I am sure many of you have wondered about these outcomes. After all, if anything we know about elections and what drives them is correct, the ARF should have been receiving much higher and perhaps even increasing levels of support. 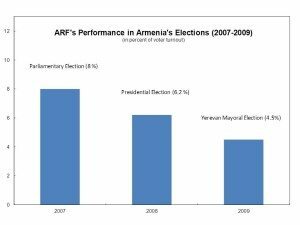 ARF’s performance in Armenia’s elections (2007-2009). Blunder #1: Handling of freedom fighter Pavel Manukyan’s case in June 2005, who was severely beaten by Seyran Ohanyan (and a number of others) in his office. The case was pushed under the carpet without receiving much by way of legal due process. Since then, Ohanyan moved to become the defense minister of Armenia, while others who participated in the beating were promoted (including to the rank of general). This was seen by many as an unwillingness of the ARF leadership to rock the boat, in an attempt not to risk the cozy relationship with then-President Robert Kocharyan, and may have contributed to the current scandalous environment in the Armenian Army. Blunder #2: Supporting a legislative amendment introduced by the Kocharian Administration in February 2007 to ban absentee voting. As part of a legislative initiative to introduce dual citizenship, which the ARF was the main force behind, casting votes by Armenian citizens residing abroad—previously allowed at Armenia’s embassies worldwide—has been banned. Blunder #3: The signing of the infamous March 18, 2008 statement by five diasporan organizations (ANCA as one of the signatories) and the signing of the Coalition Agreement with the Republican Party and others on March 22, 2008. This is even more surprising if viewed together with the fact that Vahan Hovhanissian, the ARF’s candidate, resigned from his position of vice speaker of the parliament citing gross violations during the February elections. These two steps basically gave Robert Kocharian and Serge Sarkisian a free hand to “handle” the opposition and throw several dozen of them in jail, effectively closing the window for any meaningful political reform in Armenia. Fundamental developmental changes promised by Serge Sarkisian and signed up to by the coalition members, including the ARF, are yet to materialize. Blunder #4: Unwillingness to cooperate with the Ter Petrossian-led opposition. The whole rhetoric that Levon Ter-Petrossian is one of the founding fathers of the crooked system we have now—while true—is reminiscent of holding grudges, which is not only difficult for the people of Armenia to comprehend—given the country’s state of affairs—but also difficult to reconcile with Kocharian’s own record of anti-ARF activities in Artsakh during the war, which did not prevent the ARF from becoming his power base for a decade. Blunder #5: The ARF’s membership in the coalition governments. During the past 12 years, the party was in control of critical areas of education, social security, and agriculture, having to report little, if any, positive change in these areas. In fact, the ARF’s leadership in these areas witnessed Armenia entering the lowest quintiles of world countries in terms of budgetary spending on education and health. Blunder #6: Handling of Armenia-Turkey protocols. While the end result—the ARF leaving the coalition—was as expected, many observers felt it was too little too late. It is difficult to imagine that as a coalition member the ARF was not in the loop with the preparations underway and could not have blown the whistle earlier on this biggest of all “Russian roulettes” played in Armenia’s recent history. —By being complacent and minding its own business, Diaspora effectively encouraged the abuses that have undermined the prospects for development and are effectively tearing the socio-political fabric of the Armenian society. The good news is that the diaspora—and that includes its most active element, the ARF—is still the best source for change that we have, by the virtue of the fact that it is free from Yerevan’s censorship and has the intellectual and financial resources to do much better. —Geopolitical challenges and threats remain very serious. The Armenia we currently have is not what its citizens wish it was, or what they deserve. It is also fair to say that the Armenia of today is not the Armenia of your dreams. Let me push this further: I will stand corrected if any one of you tells me today that Armenia’s political leaders are the kinds of leaders you envisioned in your dreams 25 years ago. Despite these challenges, Armenia can be as prosperous and strong as we want it to be. The current state of affairs is a direct outcome of the country’s corrupt and incompetent leadership of the past and present, and the limits imposed by Armenia’s “international partners,” who have the country’s rulers on the hook. Going forward: What can the ARF do? —Secure consistency of message: The view that the Armenia-based leadership is very close to the ruling regime is strong among people in Armenia, and stronger and more credible efforts should be made to change this perception. A message that is consistent: (1) across time, (2) with party’s own objectives, and (3) what works and what doesn’t in the world is long overdue. Having said this, once again, you are the most active and well-organized community in the whole of the diaspora. Dust the “revolutionary” of the ARF and put it to use. The nation’s future pretty much depends on you—don’t squander it! This entry was posted in David Grigorian. Bookmark the permalink. 2 Responses to ARF and Armenia: How to Withstand the Challenges of the Future? It is almost seven years since this thoughtful David Grigorian article was published. The sad state of affairs in Armenia and the Diaspora continues, eating the core values which sustain civilisation.